Marian Brown, a San Francisco grande dame best known as the surviving half of the iconic sister act The Brown Twins, has died. The news broke on Twitter and and was confirmed by the Chronicle, who report that she died at a hospice center in San Mateo. Marian was 87 years old. Marian's sister Vivian, the older of the two by 8 minutes, died early last year. 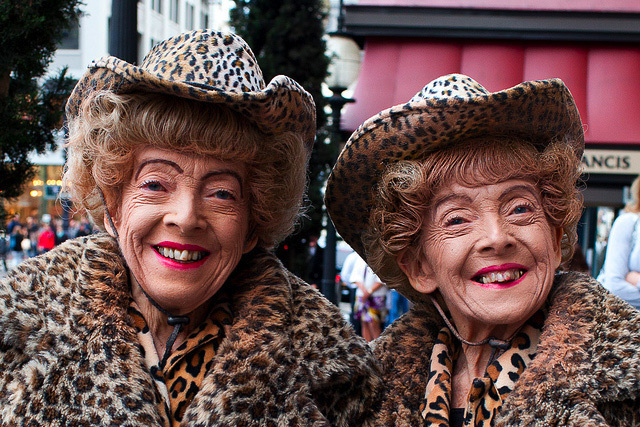 The sisters were known for their matching fashions (with more than 100 identical outfits, many of them in animal print). They posed for photos daily and sometimes made cameos in movies and commercials. They were an institution wherever they strutted, but the pair was a particular fixture at Uncle Vito's pizzeria in Nob Hill. “In this world, there are no two people who think alike, not even identical twins,” Marian told the Chronicle of their relationship in 2009. “But we think enough alike that we get along famously,” Vivian chimed in. The two even revealed that their twin beds were matching, perfect for their 5-foot-1-inch, 98-pound frames. Despite her sister's recent death, Marian rang in her 86th year in style last January at the tony Sir Francis Drake Hotel. The Browns were Born in Kalamazoo, Michigan where they were matching high school valedictorians. Marian and Vivian continued their education at Western Michigan University before working as secretaries at the Upjohn Company, all according to the Kalamazoo Gazette. Here, as posted after Vivian's death, are the two in action in 1997. All coverage of the Brown Twins on SFist. Chef Richie Nakano has been promising the city a permanent home for his Hapa Ramen pop-up and farmers' market stand since the first Obama Administration, and it is finally, finally happening on Sunday.